Carpet Browning Why Does it Happen? Many home owners may experience a brown spot or two appearing after a carpet cleaning. This is commonly referred to as carpet browning. It leads them to wonder why of course it is happening. Was it something the deep cleaning process caused? Were the floors not properly cleaned? Those brown spots and patches that occur after a deep carpet cleaning are a direct result of carpet wicking. Wicking occurs when carpet is stained deep down to the bottom of the fiber and then is moistened through cleaning. The deepest part of the fiber where the staining is becomes wet and pushes the liquid and stain up to the surface where it is once again visible as a brown or maybe even yellowish spot. You may have attempted to clean the same browning spot in the carpet only to have the browning reappear again. The most likely cause of the wicking that is resulting in browning is improper spot treatment. 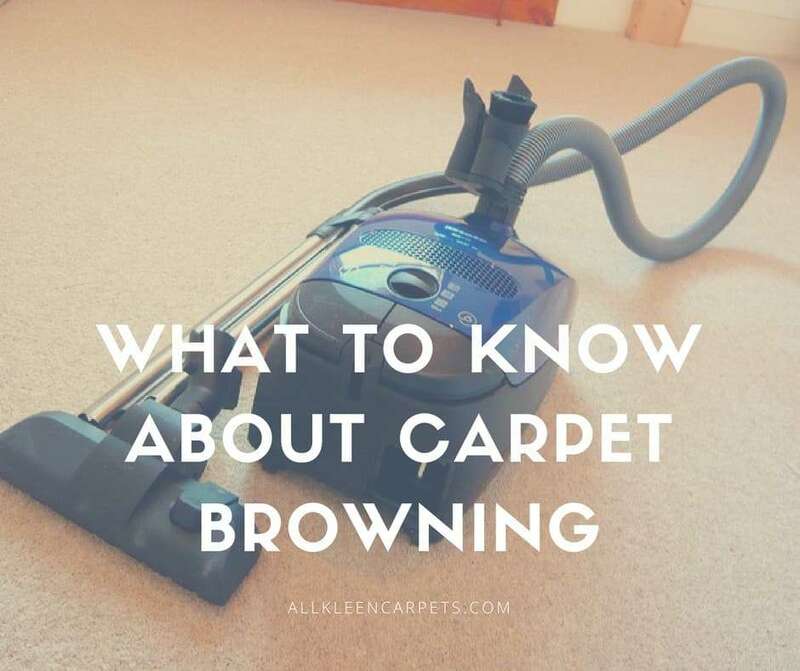 To avoid wicking and browning after spot treatment always make sure all cleaning products are thoroughly rinsed from the carpet after spot treatment and that the carpet is quickly dried as well. The best way to get moisture out of the carpet after a spot treatment is to place a clean dry towel or stack of dry white paper towels on the area that was treated and weight it down with a heavy object. A stack of thick books, a brick, large stack of magazines, a planter, a box full of objects, etc. are good for this task. Leave the towel and heavy object on the area for about 24 hours. After 24 hours sprinkle some baking soda to absorb any last bits of moisture in the carpeting. Alternatively, a wet/dry vacuum can be used to help soak up moisture in the carpet and then apply the baking soda. Give the baking soda about 2 to 3 hours to do the work and then vacuum well to make sure all of the baking soda is out of the carpet. Cellulose browning occurs in natural fiber carpets like jute, wool, sisal, cotton, and can also happen in any type of very old carpeting. You will see a brown or reddish discoloration in the carpet. If this occurs in your natural fiber carpet the best way, and only way, to remove it is with the help of a professional carpet cleaner, as at home methods will not be effective. For more carpet care tips and information please feel free to browse our blog. For the best professional carpet care make an appointment with All Kleen.